New York City is setting aside more than $700,000 to go towards testing the uniforms of Rikers Island jailers. According to the Department of Corrections, at least one guard a day is “splashed” by inmates with bodily fluids. The proposed budget for the DoC released by Mayor de Blasio’s office on Monday this week calls for $733,248 in funds for a forensic program that will “test department uniforms as a result of splashing incident,” the New York Observer reported. “Splashing,” as it’s known at the city’s main jail complex, is when inmates throw feces and urine at Rikers staffers, Correction Commissioner Joseph Ponte told reporters at a press conference this week. The DoC says that there have already been 179 splashing incidents since the start of the year, or an average of 1.19 occurrences a day. Inmates can get in trouble for dousing employees with anything, but officials can bring felony charges if they can prove that the substance “splashed” their way is more than just water. Ponte added that he doesn’t think the nearly quarter-of-a-million dollars will end the wave of splashing incidents, but being able to test substances will “expedite” the process for bring hefty charges. Nevertheless, the Observer acknowledged that, according to the Twitter account for the Correction Officers Benevolent Association, “splashing” happened at Rikers within hours of Monday’s announcement. “2 Cos [correction officers] splashed w/ feces-urine-blood,” Norman Seabrook, the head of COBA, wrote on Twitter. According to a lawsuit filed last month, it isn’t just jailers on the receiving end of assaults at Rikers, though. Attorneys representing two female Rikers inmates alleged in court that at least eight guards have sexually abused inmates there during the last few years. 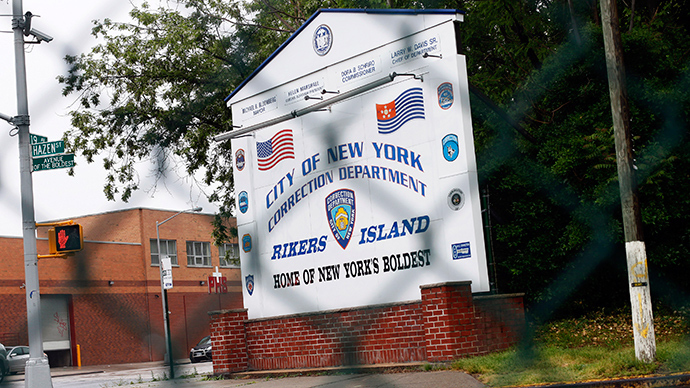 "This abuse is only possible because, in the face of repeated warnings, the City of New York has enabled a culture of complacency to perpetuate at Rikers Island and thereby consented to the abuse of women in its custody," the lawsuit reads in part.